Home Events 31 March Rewi's last stand? The last battle of the Waikato War began when the spearhead of a strong British force charged an apparently weak Māori position at Ōrākau, south-east of Te Awamutu. After two frontal assaults failed, the British besieged the pā. The battle immortalised as ‘Rewi’s last stand’ was not of Rewi Maniapoto’s choosing. The Ngāti Maniapoto leader did not want to fight in territory that was effectively already occupied by the British. Forced to do so by Tūhoe and Ngāti Raukawa, he advocated fortifying a nearby position that had a water supply and a line of retreat – and lost that argument too. By 2 April attackers outnumbered defenders six to one. The latter had no water and artillery had breached their defences. Death or surrender seemed their only options. That afternoon the defenders – men and women – left the pā in a disciplined body, broke through the British cordon and made for the Pūniu River, pursued by mounted units. 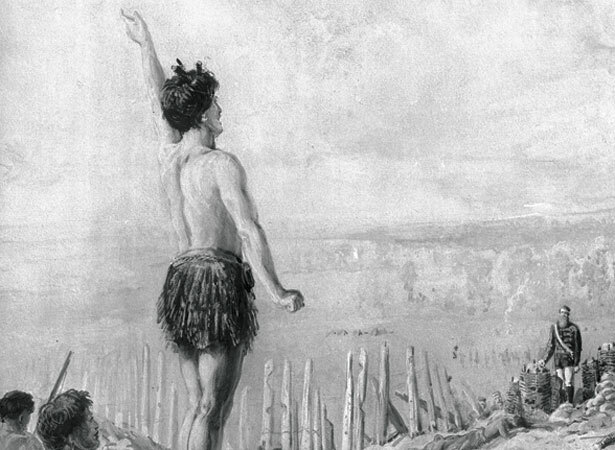 Up to 160 Māori were killed over the three days, against 17 British. But the Kīngitanga retained the capacity to fight. We have 17 biographies, 13 articles, related to Rewi's last stand?. RELATED TO REWI'S LAST STAND? No comments have been posted about Rewi's last stand?